The patented ergonomic design of the Healthy Bag redistributes weight, so the bag feels lighter creating less stress on your back, neck, and shoulders. 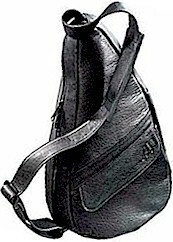 This smaller sized bag is made of soft, supple leather that is comfortable as well as stylish wherever you decide to take it. In soft Black leather. Also pricing includes Free domestic shipping and more. No sales tax if shipped to anywhere outside the state of Michigan. On-line ordering is of the highest level secure format. We also can gold hot stamp your initials at no extra charge, just specify desired initials under "Special Instructions" when placing order.